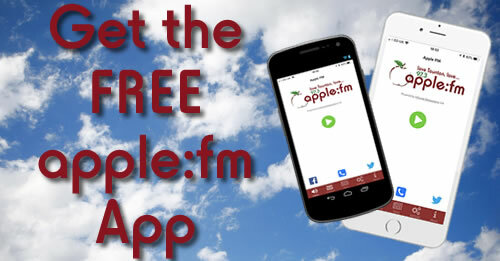 Here at Apple FM we have our very own App and it’s FREE to download now. With Live Streaming, Request Forwarding and Competition Entry all included, you are sure not to miss out. The app also contains local news headlines which are updated throughout the day via Apple FM’s Twitter and Facebook feeds. AND you can contact Apple FM for free via the App. Remember to complete the settings tab, when you first download the App, so you can send your requests or competition entries to the station. You can download the App for iOS and Android devices. Download it now via the App Store or Google Play or just click one of the shortcuts below to go straight to the download page.